Smart Monitoring of Vegetation: You get what you pay for? Advances in digital electronics and computational capabilities have boosted the appreciation and importance of remote sensing in vegetation and environmental sciences. Contemporary remote sensing technologies in vegetation science are diverse and not limited to satellite- or aircraft-based sensors anymore, but are complemented by an array of near-surface remote sensing approaches (NSRS). These NSRS approaches employ technologies such as (1) »off-the-shelf« digital cameras, (2) filter-modified digital cameras whose sensibility has been restricted to specific portions of visible light or near-infrared as well as (3) portable field spectrometers. Using these technologies, NSRS has proven great potential to economize classically labor intensive field-scale monitoring and experimental studies as it allows semi-automated, non-destructive monitoring of numerous vegetation parameters (e.g. aboveground green biomass, green vegetation cover, phenological cycle, metabolizable energy, leaf area index, canopy chlorophyll content). Therefore these technologies may also be used in the development of smart monitoring systems. However and irrespective of its potential, NSRS approaches also suffer from technology specific drawbacks, related to ease-of-use, versatility or mere asset costs. Judged upon these attributes, consumer-grade »off-the-shelf« cameras and field spectrometers occupy opposite extremes: While »off-the-shelf« cameras are affordable and easy to handle, they are only sinsible to information held within the visible spectrum of light. Field spectrometers have a much wider spectral range (hence sensibility), yet they cannot be operated without intense training nor are they affordable for private individuals. Filter-modified cameras occupy an intermediate position. Up until now only few studies have compared NSRS technologies or have assessed their respective pros and cons. Furthermore, the few studies at hand all were targeted on anthropogenically shaped environments only (e.g. intensive agriculture, managed forests), and thus potentially have hampering the adoption of these technologies in more natural environments such as rangelands, smallholder farms or common gardens. This study seeks to fill this gap and assess the absolute and relative performance of the mentioned NSRS technologies for measuring ecologically relevant vegetation metrics under near-natural rangeland conditions. Particular emphasis is laid upon the estimation accuracy, the applicability (or ease of use) of the respective technology as well as the costs involved. Ultimately, the study will work towards the development of a (semi-) automated smart monitoring systems for scientific and management-related purposes in herbaceous rangeland vegetation. The study is carried out in a semi-arid open thornbush savanna near Polokwane (Limpopo, South Africa) and in conjunction with the DroughtAct experiment. There are options to participate as a student volunteer or for MSc/BSc level theses. Applications should be sent to Jan Ruppert. 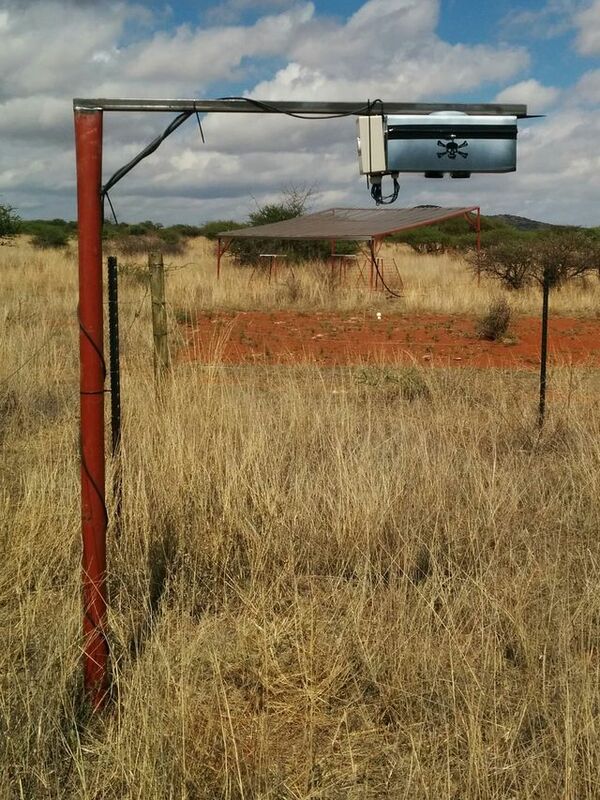 Prototype of the Smart Monitoring Camera Setup at the reseach site near Polokwane, South Africa. The system consists of one »off-the-shelf« DSLR-camera and one filter-modified DSLR (camera sensitive to NIR; >830nm). The system takes several synchronized nadir-images each day. 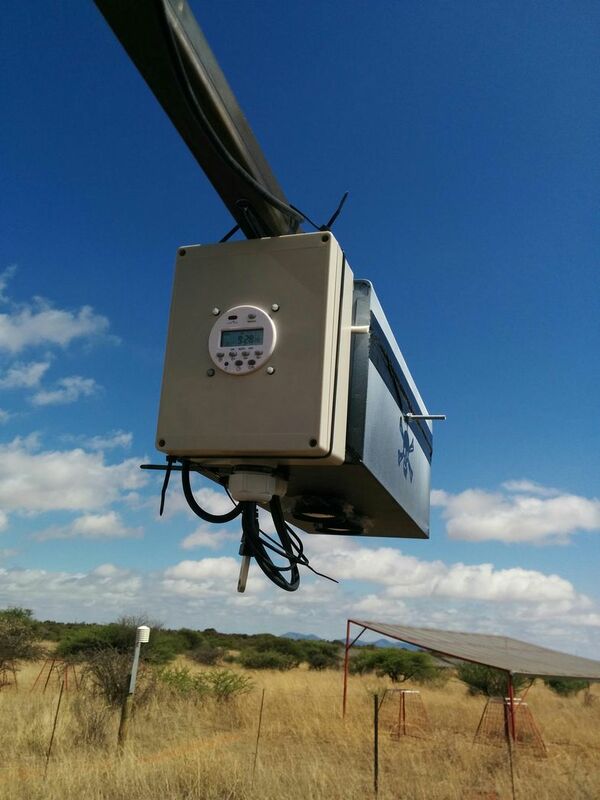 In parallel, a portable field spectrometer takes several measurements a week on the same portions of the rangeland. Detailed view on the camera and controller enclosures (lenses peaking out of the camera enclosure). The system is battery powered and controlled via a micro-computer, synchronizing the image capturing and storage. The synchronized images of the two cameras can be overlaid to create any composite image at will to derive vegetation indeces (e.g. NDVI, EVI). At a later stage the image processing and derivation of vegetation parameters may also be performed by the micro-computer itself. First results: Automated estimation of green cover from RGB-imagery based on the excess green index in R. R-code developed by Sonnentag & Ruppert. Methodological setup und research question: Different near-surface remote sensing technologies differ in their ease-of-use and costs involved. But do they also differ in their 'ecological usefulness', i.e. their applicability and precision to measure ecologically relevant vegetation parameters?